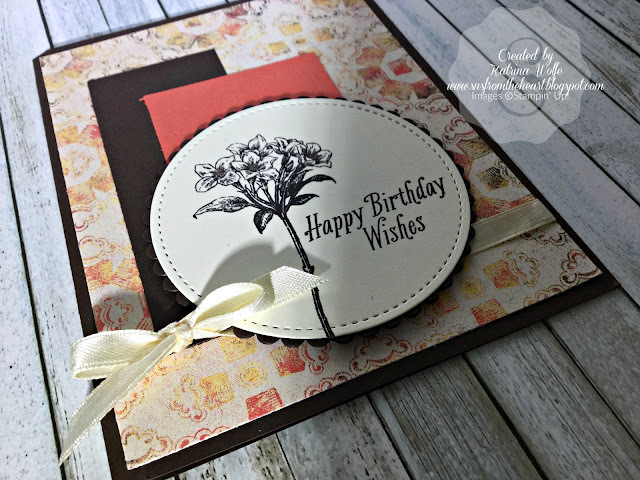 Welcome to the blog hop! I'm so glad you could join us! If this is your first stop, then you are in for a treat...just follow the links to lots of great ideas and wonderful demonstrator creations to tempt you one last time before Sale-a-Bration comes to an end. Today, I decided to share with you the Avant Garden Sale-a-Bration set. 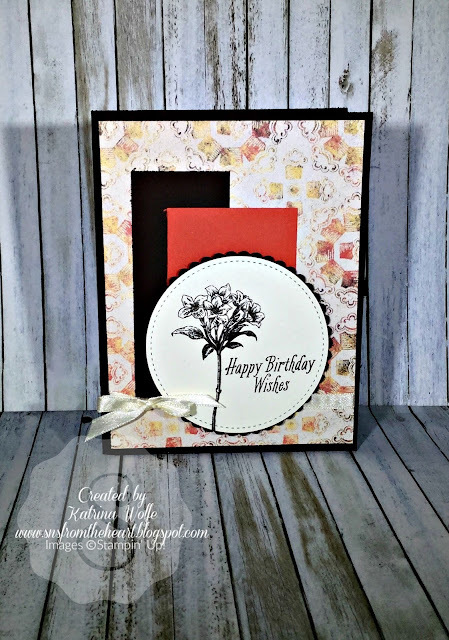 This set is so versatile and works wonderfully with the Cupcakes and Carousels DSP found in the Occasions catalog. I love how this turned out with the Early Espresso ink with the contrast of the Very Vanilla and Calypso Coral. The Very Vanilla ribbon, also from the Occasions catalog provided the finishing touch on this card. The DSP gives this card a vintage almost shabby chic look. As a matter of fact, the Very Vanilla ribbon could easily be changed out for a bit of lace from the Annual Catalog to really bring out the Shabby Chic feel but I'm really happy with how this one turned out. I hope you have enjoyed today's card. Be sure to follow the link to Janet's blog and leave comments along the way. We all truly love to hear your thoughts and I thank you so much for stopping by today.